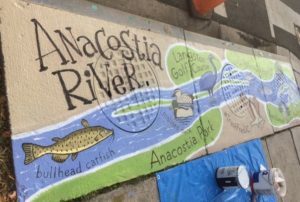 WASHINGTON—The Anacostia Watershed Society asked local artists to go wild in D.C. neighborhoods. So they did. Literally. And the results are impressive, colorful and yes, even educational. The artists’ “canvases” are stormwater drains. Through November, they had cleverly covered almost two dozen of the rectangles of concrete with regional flora, fauna and landmarks to remind residents and visitors alike that everything that flows down those drains eventually reaches the long-compromised but now-on-the-mend Anacostia River. 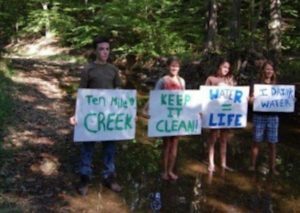 Conservation art is one way for AWS to draw attention to the threats of stormwater pollution, explains Emily Conrad, director of development at the Bladensburg, Md. non-profit. AWS launched the storm drain project three years ago in the Brookland neighborhood in Northeast D.C. and the city of Mount Rainier in Prince George’s County. Since then, Close to five dozen murals have been completed in the Anacostia watershed. 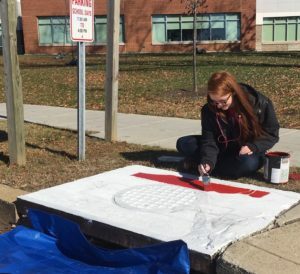 Art student Krystle Marsh works on the beginnings of her mural in November 2017. The latest round of 24 includes four in Dupont Circle finished in the summer, and 16 in River Terrace and Kingman Park/Hill East, 14 of which were completed in November. Those last two, and another four in Southeast’s Greenway neighborhood, will be painted this spring. AWS’s September call for artists yielded 140-plus designs. College student Krystle Marsh was thrilled to be among those selected by panels that included reviewers from AWS, the D.C. Department of Energy and Environment (DOEE), the D.C. Office of Planning, D.C. public schools, advisory neighborhood commissioners and civic organizations. Marsh admits she was chastised plenty of times as a child when her mother would move the couch and discover her secret easel—the living room wall. The 29-year-old grew up near Morgantown, W. Va. and spent her summers with family in the D.C. suburbs. Marsh executed her design, which melded the D.C. flag, a great blue heron and Washington’s iconic skyline, on a drain in River Terrace. 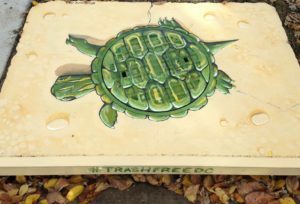 Nessar Jahanbin painted a turtle on a storm drain in D.C.’s River Terrace last fall. Marsh is on track to graduate from the Art Institute of Washington (which is actually in Arlington, Va.) this autumn with a degree in 3-D animation and modeling. She was writing a college paper about recycling when she learned of the AWS contest. “I thought it was a good cause for awareness and the pay was pretty nice, too,” she says. Each artist received a $750 stipend to cover his or her time and talent. AWS provided eco-friendly paint and other supplies. Most of the funding for this round was covered by about $30,000 in grants from the DOEE and the Doris M. Carter Family Foundation. 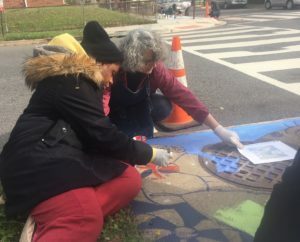 Annapolis artist Phyllis Saroff guides a River Terrace Education Campus student while painting a stormwater drain mural. Saroff’s completed mural is at the top of the post. Artists completed their mini-murals in tandem with students from a school in the neighborhood where they painted. For instance, longtime natural science illustrator Phyllis Saroff was paired with River Terrace Education Campus students while creating her eye-catching mural a stone’s throw from the Anacostia River. It features a catfish, as well as a black-eyed Susan, a rose mallow and a painted turtle. She was attracted to the project because AWS not only involved community schools but also allowed neighborhood associations to review the designs. Saroff, who earned a master’s degree in illustration, says it was a bit challenging to transfer her controlled and very precise style to a hunk of concrete. Takoma D.C. artist Paige Billin-Frye undertook this ambitious mural of the Anacostia River on a River Terrace stormwater drain. Conrad’s hope is that residents appreciate supporting community art and realize how bountiful the biological diversity is in this urban setting. Both Marsh and Saroff were pleased that neighbors took the time to engage with them. One young woman, a former AWS intern, stopped to admire Saroff’s catfish on her walk to the bus.